The Texas Legislature began meeting last week for their biennial session ending on May 29. What’s on the pro-life agenda this session? Pro-life Texas Governor Greg Abbott has challenged the Legislature to ban perhaps the most dreadful of all abortion methods — partial-birth abortion. In August 2015, he announced his LIFE Initiative: four ways to combat the harvesting, sale, and research on tissues and organs from unborn children who die from abortion. At the top of the list lies passing a ban on partial-birth abortion. Senator Charles Schwertner (R-Georgetown), a recipient of our “Courageous Defense of Life” award, has already introduced SB 8 to ban partial-birth abortion in Texas. “The state has a moral obligation to protect the unborn,” said Schwertner, a medical doctor. Texas Lieutenant Governor Dan Patrick, also a pro-life champion, made SB 8 one of his top 10 priorities by giving it a very low bill number. SB 8 also bans the sale of and research on the tissues and organs of babies who die from elective abortion, consistent with the Governor’s request. Also noteworthy, State Representative Byron Cook (R-Corsicana) introduced HB 201 to ban inhumane disposition of the bodies of children who die from miscarriage and elective abortion, abhorrent and disturbing practices such as grinding and flushing into municipal sewer systems or burying in landfills after incineration. Texas Alliance for Life strongly supports SB 8 and HB 201. We include them among our top priorities this session. Perhaps the most shocking and morally offensive of all abortion methods, partial-birth abortion involves the physician delivering a live unborn child feet first up to the head. He then punctures the baby’s skull and removes the brain by suction. The head collapses, and the physician delivers the dead child. The child dies only a few inches from being born alive. Many think it more akin to infanticide than abortion. The abortion industry calls it “dilation and extraction” or D&X. If you wish, click here to see line drawings. Partial-birth abortion appears to be a favored method among some abortion doctors. Not having been torn apart, the baby’s internal organs are more valuable for sale and research. Partial-birth abortion . . . confuses the medical, legal, and ethical duties of physicians to preserve and promote life, as the physician acts directly against the physical life of a child, whom he or she had just delivered, all but the head, out of the womb, in order to end that life. And everyone can see Planned Parenthood and the rest of the abortion industry try to defend killing of babies in this hideous manner. Hillary Clinton lost enormous credibility in the third presidential debate when she unsuccessfully defended partial-birth abortion. Will It Survive a Federal Court Challenge? It upheld a federal law that banned partial-birth abortions but clearly did not ban dismemberment abortions. Senator Schwertner closely modeled the partial-birth abortion language in SB 8 after the federal law. In dismemberment abortions, also known as “dilation and evacuation” or D&E abortions, the physician kills the unborn child using forceps and traction followed by piecemeal removal of the child by forceps or vacuum aspiration. Virtually all abortions in the first and early second trimesters, except drug induced and partial-birth abortions, involve dismembering the unborn child. For example, in the most common method in America, vacuum aspiration, a powerful vacuum machine brutally rips the unborn child into small pieces. However, in D&E abortions, the child dies while being dismembered using forceps. Of second trimester abortions in Texas and the nation, the D&E abortion method makes up the vast majority. “All those who perform abortion procedures using that method [D&E] must fear prosecution, conviction, and imprisonment,” wrote Justice Stephen Breyer for the majority. That results in “an undue burden upon a woman’s right to make an abortion decision” and thus was ruled unconstitutional. The conclusion that the Act does not impose an undue burden is supported by other considerations. Alternatives are available to the prohibited procedure. As we have noted, the Act does not proscribe D&E. Governor Abbott is calling for a state ban on partial-birth abortions to give state prosecutors a way to bring offenders to justice. State prosecutors have no authority to prosecute under a federal law. Although no one knows how many partial-birth abortions are performed every year, they certainly appear to be happening in Texas. The Texas Department of State Health Services (DSHS), does not track partial-birth abortions, and they do not report that particular method of abortion in their annual abortion reports. However, a lengthy letter dated December 7, 2016, from the Select Investigative Panel of the U.S. House Committee on Energy and Commerce referred a Houston abortion doctor, whose name is redacted, to Attorney General Ken Paxton for violations of the federal partial-birth abortion ban. Texas Alliance for Life exists to help bring all abortion to an end. We accomplish that goal by both promoting the passage of pro-life laws and then successfully defending those laws in the courts. We look forward to the day when laws protect all unborn babies from abortion and the courts uphold those laws. Unfortunately, that day has not yet come. Losing court cases just puts money in the pockets of abortionists without saving any lives. Sadly, a ban on dismemberment abortion would never be enforced, and it would save no lives. The ban would not survive a federal court challenge. The chance of success is zero. We believe it to be naive and harmful to pursue such legislation this session given the makeup of the Supreme Court now and for the foreseeable future. Since these bills will set the pro-life movement back rather than moving us forward, we cannot support these bills. The dismemberment ban will harm, not help, the pro-life movement. We do not need more legal precedent that makes overturning Roe v. Wade more difficult. Additionally, a loss in federal court would likely be a huge source of funds for the law firms representing the abortion industry that they will use to attack us and other states. Right now there are only two solidly anti-Roe votes on the Supreme Court — Samuel Alito and Clarence Thomas — and we hope John Roberts will join them. Much as we all wish it were not the case, there are simply not enough votes on the U.S. Supreme Court to uphold a direct challenge to Roe v. Wade, which is what the dismemberment ban is. The Supreme Court would unquestionably strike down legislation prohibiting dismemberment D&E abortions, the most commonly used method of second-trimester abortions, on the authority of its decisions in Danforth, Casey, Stenberg and Gonzales. The Court would conclude that such legislation had the effect of placing a “substantial obstacle” in the way of a pregnant woman seeking a pre-viability abortion, thereby violating the “undue burden” standard of Casey. Most second trimester abortions are performed using the D&E (dismemberment) method — 92% according to TRTL’s materials. In Texas the numbers bear this out. The 2014 annual report from the Texas Department of State Health Services (DSHS) shows that, of the 3,180 abortions performed from 13-20 weeks post fertilization, D&E makes up 72%. For 15-20 weeks, the number rises to 84%. A ban on this method constitutes essentially a ban on most abortions between 13 and 20 weeks, well before viability — contrary to Roe v. Wade. Justice Kennedy and the four liberal justices (Breyer, Ginsburg, Kagan, and Sotomayor) will not tolerate that. Justice Kennedy sides with the four liberal Supreme Court justices who support upholding Roe v. Wade. Even a pro-life nominee from President Trump will not change the math. 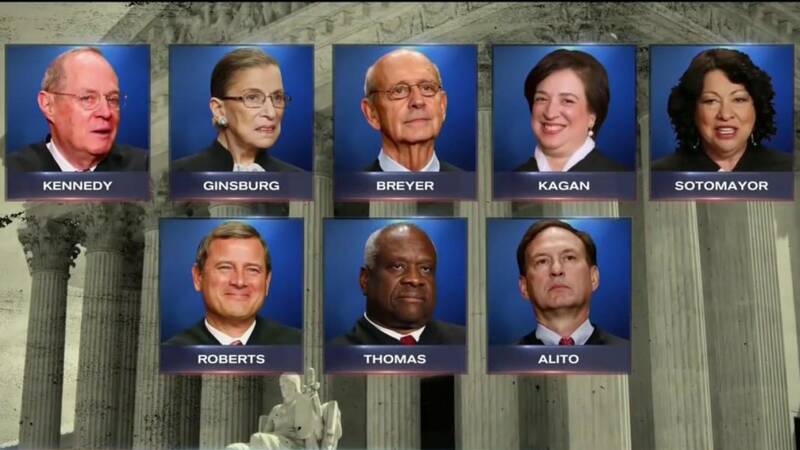 With nine members on the court, without a doubt a majority of five will vote against a ban on dismemberment abortion. We need at least two, if not three, appointments who do not support Roe v. Wade. True enough. Kennedy made these comments and more. He was explaining that, as much as dismemberment abortion is morally repugnant, partial-birth abortion is worse because it is so close to infanticide. Nebraska was entitled to find the existence of a consequential moral difference between the procedures. . . [partial-birth] D&X perverts the natural birth process to a greater degree than [dismemberment] D&E, commandeering the live birth process until the skull is pierced. Nebraska must obey the legal regime which has declared the right of the woman to have an abortion before viability. Yet it retains its power to adopt regulations which do not impose an undue burden on the woman’s right. Without enough votes to uphold a dismemberment ban on the Court, the result would be worse than a loss — it would be another huge setback like we saw last summer in Whole Woman’s Health v. Hellerstedt (that struck down the hospital privileges rule and the increased safety standards at licensed abortion facilities in HB 2). The Court would have an opportunity to further uphold Roe, creating more terrible precedent that lower courts would be obliged to use to strike down current and future state and federal pro-life laws. Six other states have passed a dismemberment ban, with poor results. Of these, four are not enforcing the ban because of court challenges. There is little doubt there would be an immediate challenge in Texas that would prevent the dismemberment ban from ever going into effect. No babies lives would be saved. When a plaintiff wins in federal court on a constitutional issue, the state is required to pay the attorneys’ fees. In Whole Woman’s Health v. Hellerstedt, the successful challenge to some of the abortion safety requirements of HB 2, the abortion providers are asking for $4.5 million. We do not know what they will end up receiving. We do know, however, that whatever the attorneys for the abortion providers receive will be used to attack other pro-life laws in Texas and in other states. True, the dismemberment ban will have a positive educational effect, but the costs to the pro-life movement — and to the babies the ban fails to protect — far outweigh the benefits. SB 8 avoids all of these pitfalls while protecting unborn babies. The partial-birth abortion ban in SB 8 has already been upheld by the Supreme Court. We need SB 8 in Texas to help shut down the harvesting and sale of baby body parts. SB 8 builds the culture of life by exposing the dreadful reality of abortion and those who defend it to the public and by declaring the State’s support for human life and aversion to infanticide. We urge the strongest possible support from all pro-life organizations and individuals for SB 8. It protects innocent human life and will not give money to the abortion industry. We are against abortion of any kind, and definitely do not want our tax dollars going to fund it. Please vote for us.